The three leading Democrats in the primary race for Minnesota governor tried to distinguish themselves Friday on issues like guns, immigration and recreational marijuana less than one week before voters head to the polls. 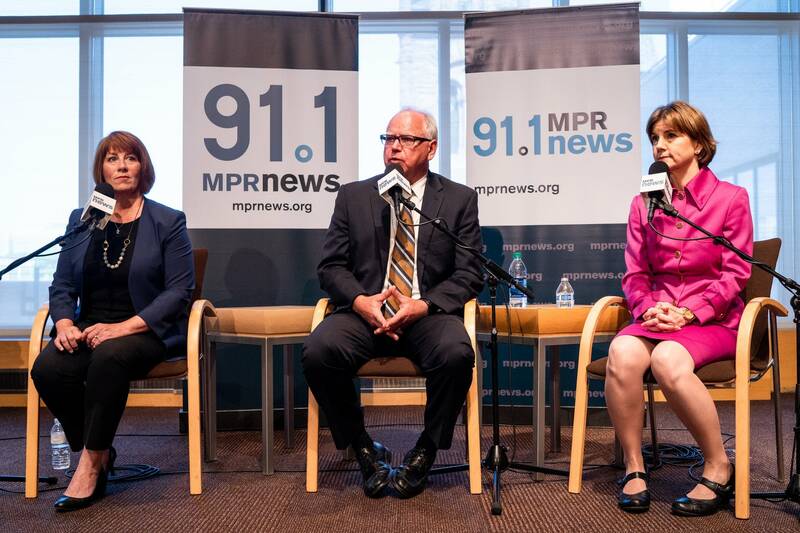 Attorney General Lori Swanson, DFL-endorsed state Rep. Erin Murphy and U.S. Rep. Tim Walz debated the issues live on MPR News — their final chance to engage with each other before the primary. Current DFL Gov. Mark Dayton is stepping down, leaving the office wide open. • Quiz: Which gubernatorial candidate do you agree with most? • Video: What is a primary election? The winner of Tuesday's primary moves on to the November election. For Democrats, the stakes are high. Republicans currently control the entire Legislature and could control all state government for the first time in state history if they win in the fall. Swanson was in the hot seat for two recent articles in The Intercept, an online publication, in which a dozen former staffers said some staff did campaign work on the state's dime in the attorney general's office. Swanson denied the allegations and attacked the publication as "a widely discredited blog" that has ties to billionaire investors that she has taken on in court. "I cost that billionaire hundreds of millions of dollars through the work of the office," she said. "When you do things like that you get a target on your back, and here we are five days ahead of a primary election." Murphy and Walz both said they do not have their legislative or congressional staff do their political work while in office, and Walz went a step further, noting the comments sound similar to remarks made by President Donald Trump. "We are in a very dangerous spot in our country, I believe, where anything being reported is dismissed as fake news," he said. The primary candidates praised Dayton's time in office, but they all said they would have different leadership styles than him. The last two sessions have ended in acrimony and with few accomplishments between Dayton and the Republican-controlled Legislature. 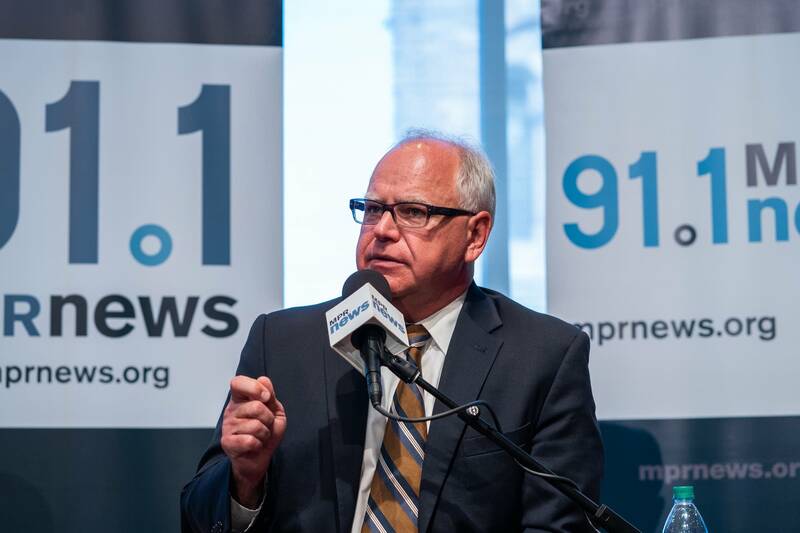 "He came in in a fiscal mess, he spoke honestly with Minnesotans about what it would take to clean that up," Walz said, but he added "leadership styles look very different." He would work to build coalitions early with lawmakers to get things done. 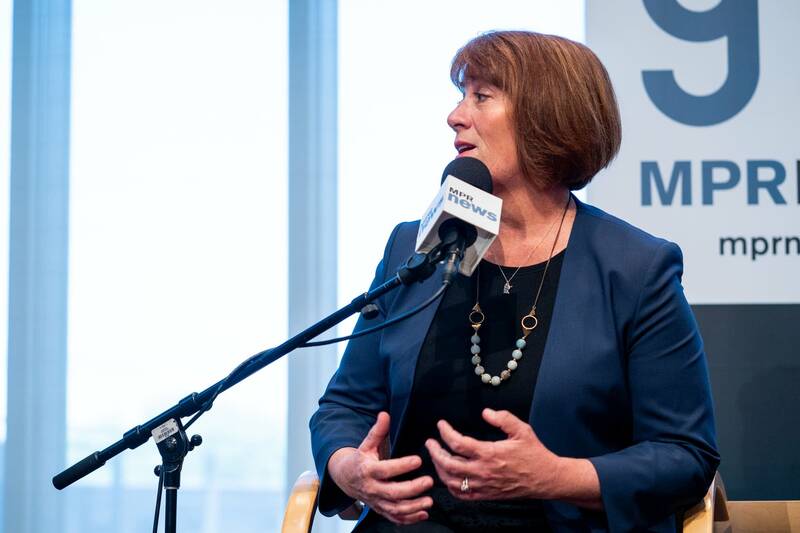 Swanson gave Dayton "high marks" on funding education and how he handled the state budget during a deficit, but she said she would try to build better relationships with lawmakers by meeting with all 201 legislators before her term starts. Murphy, who has Dayton's endorsement, said the governor has showed his "devotion" to the state, but her style would be to make her case to the citizens to build support for her initiatives as governor. "Breaking bread with the Legislature is not going to break up that gridlock at the Capitol," she said. Murphy was the toughest on federal immigration policies, as well as her opponents. 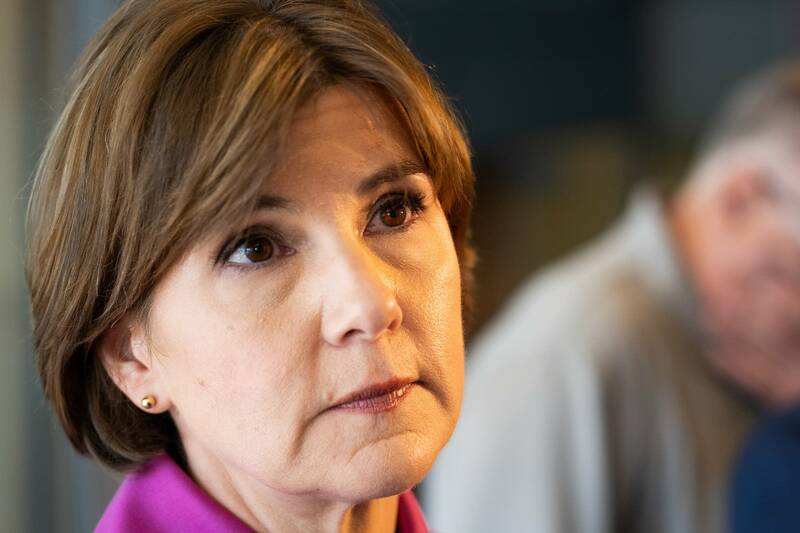 "I'm not interested in extending law enforcement's reach, the part I have control of, to ICE," she said, referring to the federal Immigration and Customs Enforcement agency. "I'm not interested in building a federal detention center." She also took a dig at Walz for past votes in favor of creating additional screening measures for Syrian refugees trying to enter the United States. "I'm not going to take a safe political vote on the issue of refugees, on the issue of immigrants," she said. Walz said the United States has a "responsibility" to keep the borders secure and "make sure you know who is coming in, but you do that with humanity." "We need to secure our borders, we live in a very dangerous world and there are people who want to do this country great harm," Swanson said. None of the candidates committed to signing a bill that would allow people with a terminal illness to commit suicide or refuse to extend their lives through treatment, but they all said they are open to the idea. "If the Legislature takes up this issue and they litigate it properly and there has been a full debate across the state of Minnesota, it is something I would consider signing," Murphy said. Walz told a personal story of watching his father, who was dying of lung cancer, sit on life support. His family continued care, but that decision cost his mother "another decade of needing to go back to work to pay the bills," he said. "This is a conversation we need to have in this nation openly." Swanson said: "We've all had family members who have gone through that type of situation," she said, adding that the state in general needs to make it easier for people to plan for their estates and long-term care. Swanson defended a recent attack television ad she put out against Walz claiming he's missed 63 percent of his votes in Congress. "That's a factual ad," she said. "These are important times in Washington," Swanson added. "I think it's important to do your basic job and show up to vote." Walz said he is running a positive campaign and was disappointed Swanson "chose to go down the low road" and participate in "name calling." He said as a congressman, he balances constituent and family services with his time in Washington, D.C.
"I'm proud of my campaign that I've stayed entirely positive, focusing on the issues," he said. After Swanson and Walz went back and forth on his votes, Murphy and Swanson had their own spirited exchange on guns control proposals. Murphy has been hard on her two opponents on the issue, who have received past A-ratings from the National Rifle Association. "In a governor, you want results and not just talk, and the fact is, Erin is saying these things now but Erin didn't become a chief author of a gun bill until about three months ago, long after she was running for governor," Swanson said. "I began my work on gun violence prevention back in 1999," Murphy fired back. "This has been a long and challenging effort on my part for many, many years." "And I've been fighting gun violence as attorney general for many, many years," Swanson said. Both Murphy and Walz want to sign a proposal that legalizes recreational marijuana in Minnesota, and both want to include a piece that expunges marijuana convictions from people's criminal records. Swanson said she supports expanding medical marijuana but not recreational. "I support looking at expanding it for medical purposes," Swanson said. "The issue on recreational for me has to do with driving. I handle in the attorney general's office about 4,500 drunk driving cases a year. I see cases where people lose loved ones on the highway. Marijuana today is so much more potent today that it was in the past."